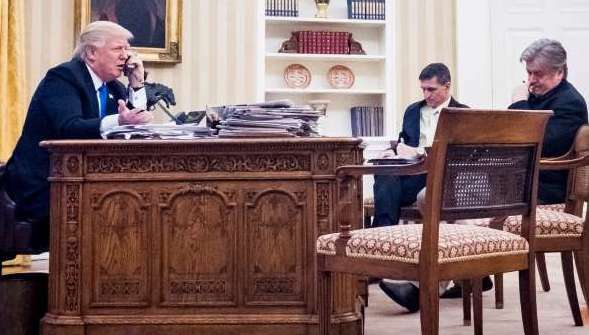 When President Donald Trump spoke by phone Saturday, January 28, with Australian Prime Minister Malcolm Turnbull, he was speaking (above) from the White House, before an audience of two aides, National Security Advisor Michael T. Flynn and his top strategist, Stephen K. Bannon. Trump’s conversation with the leader of a major U.S. ally, was supposed to last an hour. Instead, Trump hung up after 25 minutes. The Washington Post reported: “It should have been one of the most congenial calls for the new commander in chief — a conversation with the leader of Australia, one of America’s staunchest allies, at the end of a triumphant week”. Instead, President Trump “blasted Australian Prime Minister Malcolm Turnbull over a refu­gee agreement and boasted about the magnitude of his electoral college win”. The details of the call were leaked from “senior U.S. officials briefed on the Saturday exchange”. Trump’s diplomatic style is, to say the least, different. “At one point, Trump informed Turnbull that he had spoken with four other world leaders that day — including Russian President Vladi­mir Putin — and that ‘this was the worst call by far’. Someone in the White House wanted this exchange made public. Bannon and Flynn were there to hear it live. It should be safe to assume they made it public. Trump’s bellicosity is what they want the American public, and the world, to hear. Trump also wants the world to know, through Twitter, how he feels about “refugees”. His explosive conversation with the Australian Prime Minister involved what Trump, in a tweet called, a “dumb” Obama-era “deal”. Except that’s not really what the deal says. Not at all. Trump is referring to a deal signed in November. According to the agreement, which took months of negotiation, America would accept about 1,200 refugees (not, as Trump called them, “illegal immigrants”) from Australia. The United States would prioritize families and children, and all candidates would be subjected to a thorough vetting process. America’s Department of Homeland Security would conduct two rounds of interviews with each candidate. The President is following an Islamophobic script, a theme of hatred and fear shared with his aides, Stephen K. Bannon and Michael T. Flynn, that contributed mightily to Trump’s election victory. Australian Prime Minister Trumbull knows this. In a public statement he said he would not comment on the “domestic issues” of other nations. [W]e’ve never witnessed a political aide move as brazenly to consolidate power as Stephen Bannon — nor have we seen one do quite so much damage so quickly to his putative boss’s popular standing or pretenses of competence. Islamophobia is alive and well in the White House. We must assume this will continue to be a driving force throughout Trump’s administration. A phobia, according to the Merriam-Webster dictionary, is an exaggerated, usually inexplicable and illogical fear of a particular object, class of objects, or situation. It may be hard for the afflicted to sufficiently determine or communicate the source of this fear, but it exists. In recent years, a specific phobia has gripped Western societies – Islamophobia. In the past, and now in the White House, Trump aides Bannon and Flynn have displayed full-fledged Islamophobia. Trump himself, on the other hand, appears to have adopted Islamophobia as yet another tool in his personal self-aggrandizing tool box. He uses it when he needs to whip up crowds so that he might bask in their anger and their approbation for a fellow hater. Now, safely in the White House, he uses it to demonstrate his strongman image. The Obama-negotiated deal with Australia, did not involve Muslims, but they were still, to Trump, “refugees”, and right now he is playing the strongman on “refugees”. He knows the boys in the bars must be pounding their fists with this latest Trump outburst, confirming that their hatred is, in fact, the Gospel Truth. Trump was on a roll this past weekend. Saturday night he was on the phone with the Australian Prime Minister. On Friday night, January 27, President Trump issued an executive order banning travel by Muslims from seven largely Muslim nations. His acting Attorney General, Sally Quinlan Yates, refused to allow the Justice Department to defend the order. In an escalating crisis for his 10-day-old administration, the president declared in a statement that Sally Q. Yates who had served as deputy attorney general under President Barack Obama, had betrayed the administration by announcing that Justice Department lawyers would not defend Mr. Trump’s order against legal challenges. Trump fired Yates with the angry zeal his fans loved when he fired contestants on his television reality shows. Contrary to his repeated campaign rhetoric, Trump’s executive order did not cover all Muslims. The executive order Mr Trump signed blocks entry for the next 90 days to travellers from Syria, Iran, Iraq, Yemen, Sudan, Somalia and Yemen. Excluded from the list are several wealthier Muslim majority countries where the Trump Organization has business interest, including Saudi Arabia, Lebanon, Turkey, the UAE, Egypt and Indonesia. Those two lists reveal just how little forethought, experience or planning, went into the executive order. The marches and protests around airports and elsewhere that sprang up in the nation following the Islamophobic executive order, did evoke some White House scrambling and more lies. There are so many reasons to detest the Donald Trump administration’s executive order on “Protecting the Nation From Foreign Terrorist Entry to the United States” that it’s hard to know where to start. Others have already argued eloquently about its cruelty in singling out the most vulnerable in society; its strategic folly in insulting countries and individuals the United States needs to help it fight terrorism (the ostensible purpose of the order in the first place); its cynical incoherence in using the 9/11 attacks as a rationale and then exempting the attackers’ countries of origin; its ham-handed implementation and ever-shifting explanations for how, and to whom, it applies; and, thankfully, its legal vulnerability on a slew of soon-to-be-litigated grounds, including that it may violate the establishment and equal protection clauses of the U.S. Constitution. Foreign Policy states that Trumps’ claim that he is following an earlier Obama executive order, “obscures” at least “five enormous differences between the executive order the White House issued Friday and what the Obama administration did”. The Obama administration’s 2011 review was narrow. It covered the vetting procedures applied to citizens of a single country (Iraq). It applied only to refugees and applicants for Special Immigrant Visas (SIVs), created by Congress to help Iraqis (and later Afghans) who supported the United States in those conflicts. Obama’s 2011 order was not a ban. It “did not ban visas for refugees”. Refugees do not travel on visas. The Obama administration’s 2011 review “came in response to specific threat information, including the arrest in Kentucky of two Iraqi refugees, still the only terrorism-related arrests out of about 130,000 Iraqi refugees and SIV holders admitted to the United States”. The 2011 Obama review involved a dozen deputies and principals committee meetings, including cabinet and deputy cabinet-level officials from all of the relevant departments and agencies — including State, Homeland Security, and Justice — and the intelligence community. That bad policy making and confusion bordering on chaos comes from a White House now led by purveyors of Islamophobia. This is Day Fourteen of the Trump presidency. We have 1446 days left until the next inauguration, January 20, 2021. This entry was posted in Donald Trump, Middle East, Middle East Politics, Stephen Brannon. Bookmark the permalink. While Trump plays with fire, we in Quebec have already experienced the tragic consequences. Not surprisingly, this terrorist act turned on their head the fears that Trump stokes: a caucasian Quebecer born and bred slaughtering praying Muslims. Rather than giving pause for thought, Bannon no doubt will spin this to further his insidious agenda. For me it triggered the memory of a not dissimilar event 23 year ago just down the road from my then home, when a Jewish settler terrorist massacred 29 praying Palestinian Muslims in Hebron. Then too, all the stereotypes were turned on their heads. As a direct result, with the outcome nonetheless built upon the racist stereotypes rather than the reality, the Jewish settlers were permitted to take over much of the historic mosque and downtown Hebron while the Palestinians endured months of curfew, relegating the latter until now to second-class citizens in their own city. We do need continuing puncturing of “alternate facts.” Thanks for doing this, Jim! I have always believed that some media are the best interpreters of fact. While watching an episode of “Quantico” on television this last week, I was struck by the message that there are four or five tactics one should use to leverage an “asset” to get the confession or information desired. It was named “M.I.C.E.” These initials mean: “Money” (follow it), “Ideology” (every person has one; identify it and use it), “Coercion” (force the person to speak or act to ONE’S OWN ADVANTAGE), “Ego” (it gets in the way of most would-be tyrants or wimps). The “teacher” then added a fifth tactic: D, for “Doubt” (sow self-doubts in the mind of the asset). Take EACH of these individually. Do they not describe President Trump’s strategy? Forget being reasonable or logical. Think of him as a bullying salesman or an advertisement. You probably would not argue with a television ad. Instead, you’d probably identify its tactics. Refuse to act the way the bully WANTS you to respond. ACT with the wisdom of a serpent and the innocence of a dove! Follow the money, as Jim did here. See the ideology of Islamaphobia. Isn’t the coercion of refugees impossible to miss? Trump’s Ego seems to be with him constantly, causing him to blunder in his role. He’d also like you to have your doubts about the media, the rule of law, your very worth as a human being.